PCAP also includes policy roadmaps from the Alliance to Save Energy for changing America’s building practices and from the Center for Neighborhood Technology on retooling America’s transportation policies. It offers a detailed plan for reducing emissions from the world’s largest single energy user, the U.S. government. 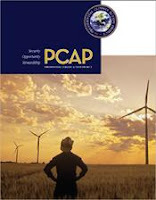 Because we anticipated that the legislative branch might be sensitive about presidential abuse of power in the wake of the Bush Administration, the PCAP team commissioned an extensive analysis of the president’s authority to act on climate and energy without waiting for Congress. Scholars at the University of Colorado School of Law studied the 96 current statutes in the U.S. Code that specifically address climate change; many of our landmark environmental laws; 140 federal court cases and 370 executive orders going back to 1937. They analyzed about two-dozen executive orders proposed by PCAP and identified the specific statutes that give the president the authority to implement them. The conclusion: President Obama will take office with plenty of power to jump-start federal leadership on climate and energy security and to begin America’s necessary transformation to a safe, sane and secure 21st century economy..
1. A fair, workable, transparent and elegant scheme called “upstream cap and auction” to put a price on carbon, generating between $100 billion and $250 billion annually. Part of the money should be returned to the American people. The rest should be invested in clean energy research, modernization of America’s infrastructure, a training program for green jobs, and grants to states and localities for “energy and climate security plans”. 2. The repeal of federal subsidies for fossil fuels so that our tax dollars are no longer distorting market signals and paying to ruin the planet. --> Seek a bilateral agreement with China to reduce both nations’ greenhouse gas emissions and to collaborate on clean energy technology. A concrete commitment in 2009 between the world’s largest developing and developed nations would be an enormous breakthrough before the international community gathers in Copenhagen in December 2009 to figure out what to do after the Kyoto Protocol expires. --> Reinstitute specific carbon-cutting goals for the federal government (they were removed by the Bush Administration) and mobilize the game-changing procurement power of the government to buy green energy and products. --> Forbid political censorship of federal climate science and give government scientists the right of last review of their technical conclusions. --> Set ambitious new energy and climate goals for the country. We should reduce our greenhouse gas emissions 30 percent by 2020; cut our oil imports in half by 2030; raise the CAFE standard to at least 50 mpg by 2025; achieve zero-net-carbon buildings by 2030; and cut energy consumption in half by 2030. --> Begin regulating greenhouse gases under the Clean Air Act. Regulation will help convince the international community that we’re serious. More importantly, regulation will begin cutting emissions even before cap-and-auction takes effect, and curb emissions that a cap-and-auction system cannot. --> Order agencies to review the more than 200 financial assistance programs administered by the government and redirect them wherever possible to invest in the new economy rather than the old. --> Appoint climate experts rather than lobbyists to senior positions. We have provided President-elect Obama’s transition team a list of 250 senior jobs where we believe climate expertise is critical, along with the names of 200 experts who should be considered for appointments. These investments in a new energy economy – including a market-based system to gradually raise the price of fossil fuels -- won’t be easy in this time of economic hardship, but they are necessary. The cost of not acting is much higher and much more painful. President-elect Obama knows that. He also knows that while have promised him a rose garden, no one said there wouldn’t be thorns.